Buy a gun and be done with it. I am no gun-toting, “a pistol in every hand and an AK-47 in your underwear” supporter. I loathe all guns of all types and all eras—pistols, rifles, and phasers—almost as much as I loathe the violence-prone society that we have become and from whence such implements of destruction come. My point is, don’t be a victim. And don’t especially be an emotional victim. Fearing for your safety in domestic disputes is an ugly reality that all too many women, children, men (yes, men) and elders live with. But putting a small latch with four small screws on an old door frame does not buy security, it gives you the delusion of security. If you really live in fear, be realistically and fully committed to a workable protection plan. And whatever that plan is, be ready with it, be ready to implement it, implement it when it is necessary and don’t look back afterward with any regrets. Thank you for reading Straight for the heart. I sincerely hope you have enjoyed it and I humbly appreciate your visiting the Book of Pain. As always, I look forward to your comments. what a desperate set they make! to deny them—to just go on and ignore them. to the right and straight on ’til morning. People think they are in control of their lives, but they are not. People are in control of their actions, but the forces that impinge on us are beyond our ability to control, coerce, and often, understand. The source of all good is trust in God and contentment with His holy will and pleasure. That does not mean that people are not responsible for their actions. But so much of life is beyond that limited degree of control. Illness, the way people appreciate your efforts, the way they treat you…you may be able to influence such things in a positive direction, but you cannot force them to be what you want. And in some tragic ends, there are those who even chose the hardest and saddest of all options: opting out. Thank you for reading Zodiac. I sincerely hope you have enjoyed it and I humbly appreciate your visiting the Book of Pain. As always, I look forward to your comments. and adorned with carpets, paneling, and a lamp. The House of the Báb, located in Shíráz, Iran, was where the Prophet-Herald of the Bahá’í Faith, the Báb, first declared Himself to His first follower, Mullá Husayn in 1844. This poem gives voice to that building and its story. Its significance in the Bahá’í Faith is tremendous, even beyond its historical importance; it has been designated by Bahá’u’lláh, the Founder of the Bahá’í Faith, as a place of pilgrimage, indeed the central place of pilgrimage for the Bahá’í Faith. Although at one point in the mid 1880s the House had fallen into disrepair when occupied (and nearly stolen) by non-Bahá’ís, it was restored to prominence in the late 1890s and re-occupied by the Widow of the Báb, Khadijih Bagum. Then in 1905 it was again re-modeled and put back into exactly the same configuration and decor as it had been in 1844 at the time of the Declaration of the Báb. Interestingly, this was done by the last person alive who had intimately known the house at that time and just prior to his passing. Below is a photograph of the refinished room where the Declaration took place. 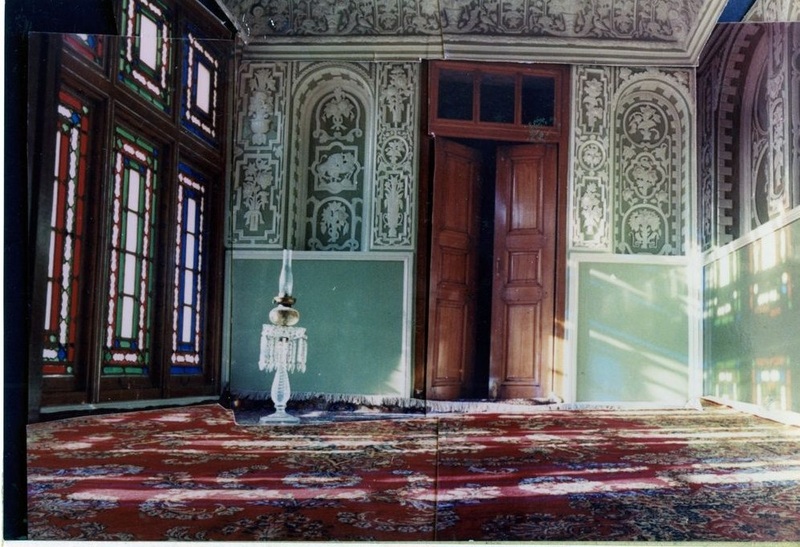 It is paneled and opulently furnished with a beautiful Persian carpet and a lamp in the exact spot where the Báb sat on that famous night. These are the adornments referred to in the poem. Room in the House of the Báb where the Declaration took place. Unfortunately, the House of the Báb often drew the enmity of the fanatical populace, especially when incited by the equally fanatical clergy, and the building was often attacked. One such time was particularly bad in 1955. Then in 1980 during the post-Khomeini era when the clergy first became the government, the building was illegally seized, razed to the ground and the lot paved over. This event also coincided with the martyrdom of ten Bahá’í women of Shíráz, one of whom was the 17 year old Mona Mahmudnizhad, who asked to be hanged last so that she could support the others if they needed it. The building itself may be gone but it still exists in the hearts and minds of Bahá’ís the world round. There it will stay until it can be re-built in the fullness of time. Thank you for reading I am not here, but I will always be there. I sincerely hope you have enjoyed it and I humbly appreciate your visiting the Book of Pain. As always, I look forward to your comments. — from One Today, the poem by Richard Blanco, read by the author during the 2nd Inauguration of President Barack Obama, January 21, 2013. See the full poem here. I am not in any grave risk of being asked by a future President of the United States to write an inaugural poem. Good thing, because I cannot imagine what I would say. It is the largest poetic platform in the world and a poem read there is automatically slated to be famous (if good) or infamous (if bad) and often both. The inaugural poem tradition was started by Robert Frost in 1961, when at the invitation of President J. F. Kennedy he read his The Gift Outright. Not an easy act to follow. But Richard Blanco did, and did it well. One Today is a beautiful poem, honest, upbeat, not too sentimental. It has a strong heartbeat and an honest pace. proclaiming their love to the heart. To God that I was so perfect! The 360° in a circle is evenly divisible by many numbers, nine out of the first ten, for example. (The exception is seven.) But it is the perfection of the circle surrounding its focal point that attracts me to it as a metaphor. Thank you for reading The circle. I sincerely hope you have enjoyed it and I humbly appreciate your visiting the Book of Pain. As always, I look forward to your comments. My wife and I were driving to a Bahá’í conference when I noticed a hand painted sign off to the side of the road which said “Black Ledge” and an arrow pointing off in a direction. It was both incongruous and odd; why would anyone point to a black ledge? It struck a chord with me and I linked it up with a conversation I had previously had with my dearest friend and brother-in-heart, Sam, about service to humanity. Such service is an essential aspect of being human and yet it is not easy, nor does one pursue it without pitfalls and aches. Moreover, it can be wearisome and tiring, not the least of which because it can often fall on deaf ears and cold hearts. Yet, still it is important to continue and pursue such work, because you do it not just for the recipients, but for yourself, to learn humility and patience. To learn humility and patience. That is my dear Sam in a nutshell. Thank you for reading The next after another. I sincerely hope you have enjoyed it and I humbly appreciate your visiting the Book of Pain. As always, I look forward to your comments. that lie thick all around, gasping. I will stand with you wherever you land. A major life changing crisis is a difficult thing to survive and manage. The feelings and emotions are so intense and the risks so very real. But once it is over—well that’s the question, isn’t it—is it ever really over? Certainly from the viewpoint of people on the outside of the event there may come a time when, for them, the crisis is past and life returns to normal. But for the person at the apex of the crisis it continues to be not just what they went through, but what in the end it means to them going forward. Such were my thoughts when thinking about a dear friend who had gone through such an event. I instinctively knew there would come a time when the world would carry on, but that that was the precise moment when she would be at her most vulnerable, when she would most need a friend to tell her that she was loved and that she would be supported when she needed it. Someone who was not, “Thank God that’s over, ” because it is, but it isn’t. I remember my friend telling me that she did not want her crisis to be the event that defines her; she was more before it happened and would be more after. And yet, how can you not review your life, review where you are, review where you’ve been, think about where you are going, after a crisis? In the end, no matter how much you empathize, no one can understand more than the person who is living it, what they have been through and what it means. But what you can do is pledge to be there for them, whenever and however and whatever they need. You cannot live someone’s pain, but you can always help them live it and survive it. That is what friends do. Thank you for reading In the wind. I sincerely hope you have enjoyed it and I humbly appreciate your visiting the Book of Pain. As always, I look forward to your comments.